There are plenty of options in Greater Mankato to help reach your business goals. Click on the headings below to learn more about available resources and incentives in the region. And you can find a full listing of services provided by Minnesota DEED at this link Business and Community Development Resource Guide. 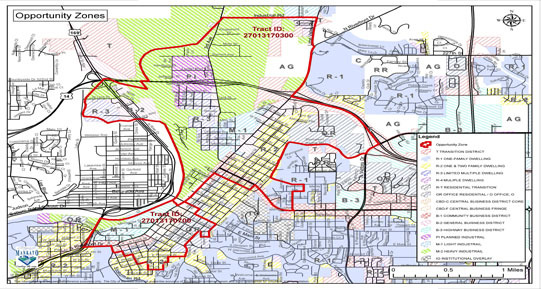 The City of Mankato has two census tracts designated as Federal Opportunity Zones. 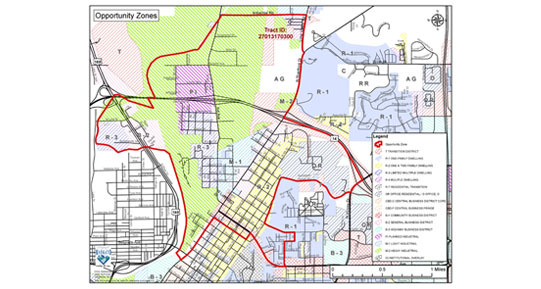 These “O-Zones” are an economic development tool as well as a tax deferral opportunity on capital gains. It was established by Congress in the Tax Cut and Jobs Act of 2017 to encourage long-term investments in low-income sections of our communities. 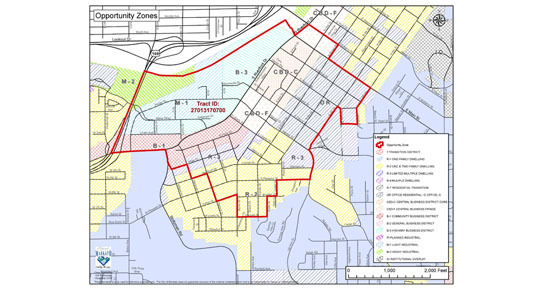 227013170700 – This area in the southwest portion of the city includes the Sibley Park redevelopment project where a substantial amount of investment is already underway with commercial and multifamily housing opportunities. The city government strategic plan notes it wants to support economic development and support a collaborative community development service model that welcomes business and simplifies processes. It also is determined to continue its dialogue through expanded partnerships and collaboration. Implementation of Opportunity Zones has been delegated to the IRS by the US Department of the Treasury’s Community Development Financial Institutions (CDFI) Fund. Talk with your financial advisor to see if this opportunity fits with your goals. The Greater MN Job Expansion Program provides sales tax refunds on purchases of property and services to businesses located in Greater Minnesota that increase employment. The Greater MN Job Expansion Program provides each qualifying business up to $2 million annually in sales tax refunds and could benefit your business if you plan on adding as few as two employees in the next year. Click here to visit the Greater MN Job Expansion Program page on the MN DEED website. Healthcare insurance is a significant expenditure for small businesses. To offset the cost of health care insurance, the IRS is offering a credit. See if your business qualifies. Finances the costs of a new real estate development by utilizing funds gained through increased property taxes generated from the development. PACE is a financing tool used to assist commercial and industrial businesses (including agribusiness) with improvements that substantially increase energy efficiency. PACE allows businesses to make these fixture improvements without the up-front capital outlay. Costs for the improvements are paid back through a special assessment on their taxes. The increase in property taxes is offset by the decrease in energy costs so that the business sees no change in the bottom line. Minnesota Department of Commerce, Division of Energy Resources produces a list of state and federal funding opportunities on a regular basis. The list includes solicitations of proposals for energy or environmental grant funding or other incentives from a wide variety of organizations. The fund provides up to $1 million in grants to approved business after specified job creation and capital investment goals are achieved. Minimum requirements: 10 jobs created and $500,0000 capital investment. Actual job creation and investment rebates are based on project parameters. Provides state grants to educational institutions for the development of training programs that meet specific business needs. The board also operates the Higher Education Loan Program (HELP), through which businesses may be awarded an interest-free loan to pay for worker training, and operates the Pathways Program, which provides grants for the development of training programs for individuals transitioning from public assistance to work. Minnesota Angel Network (MNAN) was formed to promote a more active angel investment community in our state. MNAN educates entrepreneurs about preparations required to obtain investment capital and facilitates connections between angel investors looking to make investments and businesses that are seeking angel investment. MNAN assists companies in all major sectors of business, including but not limited to medtech, high tech, and cleantech. Involvement with MNAN is free to investors. Provides financing as part of the RAINSource Capital network. TRAIN is an LLC formed in Greater Mankato. The fund is capitalized at $800,000 with 16 accredited individual and institutional investors. Would your business benefit from a financial check-up at no charge to you? The Small Business Development Center in Mankato is positioned to analyze your financials using sophisticated software designed to give you the information needed to assess your business' financial health. 504 Corporation is authorized by the U.S. Small Business Administration to make SBA 504 loans up to 40% of a project cost for land, buildings and machinery as 'subordinate' debt to a bank's first lien (50% of project cost); leaving only 10% required by the borrower. Single-use facilities, equipment and start-up businesses may require an additional 5-10% cash injection by the borrower. Contact 504 Corporation, Mankato at 507.625.6056 or the corporate office in Rochester, MN at 507.288.6442. Provides low interest, revolving loan funds primarily for industrial/service economic development (financial incentives form). Provides low interest, revolving loan funds for reinvestment in Mankato's City Center. Provides grants to help add new workers and retain high-quality jobs on a statewide basis. The focus is on industrial, manufacturing, and technology-related industries Grants are awarded to local units of government who provide loans to assist expanding businesses. Region Nine Development Commission seeks to create new jobs in the region by administering a Revolving Loan Fund to assist existing and new businesses in securing financing they are otherwise unable to secure through traditional channels. For established manufacturers with fixed asset expansion costs in excess of $1 million and adding a substantial number of new jobs. Through industrial development bonds, the Agricultural and Economic Development Board can support a loan at below market interest rates. Invests in emerging businesses and the emerging workforce, helping businesses, local governments and nonprofit organizations find common ground, pool resources and achieve more. Loans available to support clean and renewable energy. Greater Mankato financial institutions can provide the fundamental financial services needed for your business as well as conventional financing tools. The program provides consulting services to help small manufacturers that employ up to 100 workers become more efficient, more competitive and more likely to thrive and grow. GAP provides grants of up to $50,000 which are matched dollar-for-dollar by companies. An online tool designed to allow businesses to view taxpayer records, file returns, make payments and update registration information. Businesses are able to access information 24-7 and benefit from real-time help.